Pack the wicker baskets and slather on the sunscreen for a lazy afternoon at this stunning family picnic spot. Just across the river from the village of La Roque Gagaec, park under the trees in the nearby orchard and set yourself down by the river. If you want to make the most of it, pack some colouring pencils and sketchbooks and challenge any young artists to capture the views. Look across to the imposing Château Castelnaud and imagine the medieval drama which will have taken place in its surroundings. The picnic spot at Castelnaud is located in the grounds of the Walnut Museum. Follow signs to the castle and continue up the steep, winding road to the museum. Picking one favourite is just too tricky, but you’ll find plenty of charming street cafes in which to spend hours amid the medieval architecture and relaxed French atmosphere. 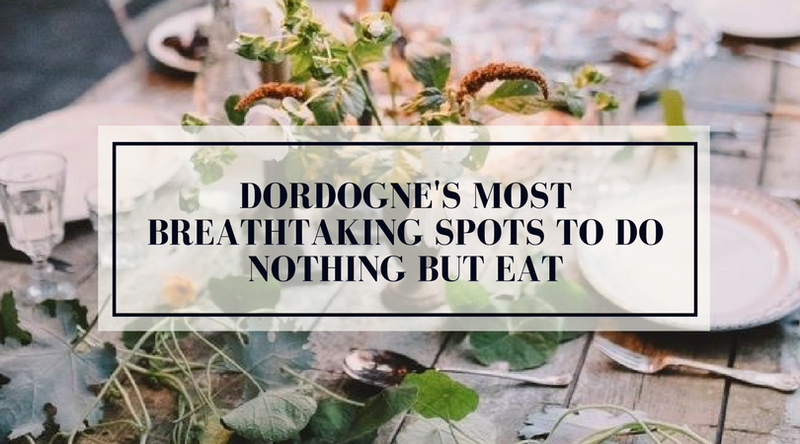 Take a walk through Sarlat, Domme, or Bergerac and look out for the tables and chairs signalling a quiet spot for al-fresco dining. The beautiful gardens of Château des Milandes are another beautiful place to picnic in peace. Take in the calming scent of the lavender borders or sit beneath the shade of the yew trees. The Château is also known for its kids’ workshops, previously offering sessions in falconry, exotic bird feeding, and how to be a Muskateer! Another lovely green spot to picnic is situated in the woods overlooking Cingle de Trémolat. There’s something about the vast French countryside that invigorates the soul! Pick a Tuesday if you wish to stock up on fresh nibbles from Cingle de Trémolat on the way. For awe-inspiring views of the Monbazillac vineyards (and amazing food) head to La Tour des Vents. Located on the highest point of Bergerac’s southern hills, you are in for a treat here as you enjoy the panoramic landscapes which stretch for miles and miles. There’s a children’s menu too, so little ones needn’t miss out on the chance to play eye spy out in the sunshine. Just 10 minutes from our La Verger property, the postcard perfect surroundings of Château Monbazillac are an ideal place to have a family picnic. If you did want to soak up some history while you’re there, you can take a guided tour or explore the castle at your own pace. Wine lovers will be particularly impressed with the Château’s wine cellar featuring a wall of 6,000 bottles of Monbazillac! We’ve ensured that each of our properties are a tranquil home-from-home in wonderful surroundings - designed for loafing (and lunching) in peace with the people you love. Whether you decide to gorge on fresh fruit by the pool or cook a family feast together and enjoy it on the patio – our villas and cottages are the perfect base to have a stay where you do nothing but delight in food, glorious food.